Could partition solve Ukraine’s problems? The last two Ukrainian presidential elections suggest how strong a role national identity appears to play in determining voting behaviour. 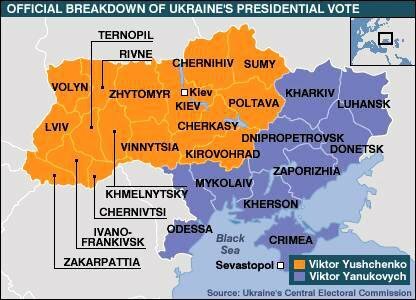 Last Sunday, as in 2004, Viktor Yanukovich received a majority of votes in Eastern Ukraine, where most of the population has a closer affinity to Russia than to Western Europe. Western Ukraine used to be referred to as "New Russia," in recognition of the fact that these lands were only added to the Russian Empire through conquest in the 17th and 18th centuries. With respect to political attitudes, the majority here seem to hold views which are closer to those of Poles than Russians. Still, the Russian/Ukrainian linguistic/national distribution in the country is not uniform.The issue of self-identity is complex. But it is no accident that Mr. Yanukovich has more appeal to Ukrainian citizens of Russian national origin than does Ms. Timoshenko, the catalyst behind the so-called Orange Revolution, which has disappointed popular expectations. as a foreign policy success for the Kremlin. It looks as if Russia will have a satellite on its southern frontier -- it is doubtful whether either the Russian leadership or Mr. Yanukovich would risk Russian absorption of Ukraine. statements, polls and sociological surveys, Ukraine has not completely solved its nationality problem. The present situation has certain parallels with Yugoslavia during the 1970-80s. Then, to the chagrin of the federal government, more people thought of themselves as Bosniaks, Croats, Montenegrins, Serbs and Slovenes, than Yugoslavs. While the preservation of Yugoslavia proved untenable, the failure to reach a political solution led to incomprehensible death and destruction.